Showing results for tags ' law'. I broke the law but dang it was fun. Some of you have seen the pics or vids of where I ride across from my house. Well it looks like a creek to many but it's just a small part of a bigger river. So today my friend ask if I have ever crossed the bridge and gone to the other side of the river. My answer was no I went and He said he's been riding there all summer and when he see other people out there they wavy in passing. It turns out it's set up for hunting and hanging out it has tables & chairs an enclosed deer stand.We went in thru a trail when we left we were on the field riding we came out and there was a gate where we ended up comming out and was posted no tresspassing. I'am going to see if I can find out who owns the land and see if they mind us riding there I don't want to get in trouble or disrespect someone. I hope they say YES!! That would give me plenty of trails to ride on. I agree with this because the first time I took my new four wheeler out years ago, I had no experience in riding. I was going slow and still turned the 4-wheeler over and had a few bruises and was lucky to not get hurt any worse. So it doesn't matter how slow or how fast. It has to do with technique. So everyone please take a safety course for yourself, your family and the ATV community. This just went into effect yesterday. Four counties in southwestern Colorado that passed a law requiring driver's licenses and liability insurance for ATV riders want the state to enact similar requirements. Officials in San Juan, Hinsdale, Ouray and San Miguel counties enacted the stricter law in 2006 to maintain safety on the Alpine Loop, a scenic, rugged trail through the San Juan Mountains that links Silverton, Telluride, Ouray and Lake City that has become a popular tourist attraction. 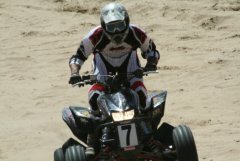 State law does not require liability insurance and allows children as young as 10 to operate ATVs. A ranger last year issued 250 warnings and 15 citations, which carry a $150 fine. Officials say many visiting the area are caught off-guard by the local requirement and have threatened to visit other areas of the state.